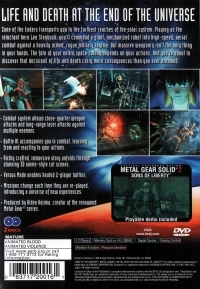 Publisher(s): Konami Computer Entertainment Japan Co., Ltd. Box Text: LIFE AND DEATH AT THE END OF THE UNIVERSE. 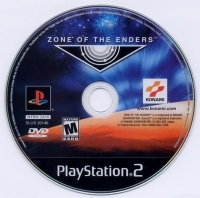 Zone of the Enders transports you to the farthest sides of the solar system. Playing as the reluctant hero Leo Stenbuck, you'll command a giant, mechanized robot into high-speed, aerial combat against a heavily armed, rouge military regime. But massive weaponry isn't the only thing in your hands. The fate of your entire space colony depends on your actions. And you're about to discover that decisions of life and death carry more consequences than you ever dreamed. 01-26-2014 TheHunterPersian Box Text LIFE AND DEATH AT THE END OF THE UNIVERSE. Zone of the Enders transports you to the farthest sides of the solar system. Playing as the reluctant hero Leo Stenbuck, you'll command a giant, mechanized robot into high-speed, aerial combat against a heavily armed, rouge military regime. But massive weaponry isn't the only thing in your hands. The fate of your entire space colony depends on your actions. And you're about to discover that decisions of life and death carry more consequences than you ever dreamed. 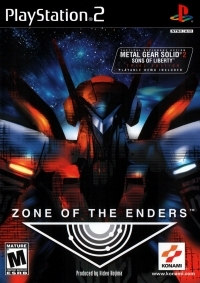 This is a list of VGCollect users who have Zone of the Enders in their Collection. This is a list of VGCollect users who have Zone of the Enders in their Sell List. This is a list of VGCollect users who have Zone of the Enders in their Wish List.